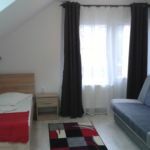 Rooms, services 6 comfortably furnished rooms are offered by Melinda Vendégház Parajd to guests looking for accommodation in Praid. 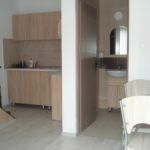 Services designed especially for small children ensure that the complete family will have a nice time at this guesthouse. There is a parking space available on the spot, so in case you are arriving by car, you will be free to leave it there without any additional costs. At the guesthouse you may go online via wireless Internet connection (WiFi). The exact scope of services offered by Melinda Vendégház Parajd (including those for an extra fee) and the exact equipment of a room are available on the information sheet below and on the information sheet of the given rooms. Catering Booking prices indicated do not include catering. Arrival, opening hours The earliest time of check-in is 14:00, the latest time of check-out is 11:00. The personnel can communicate with you in the following languages: English, Hungarian and Romanian. Reserve your accommodation and Melinda Vendégház Parajd will directly send their confirmation, the expected reply time is 30 minutes (guaranteed in 1 workday). The rating of Melinda Vendégház Parajd is 9.8 from the maximum 10, 19 based on actual and valid guest ratings and reviews. "A szálláson belül sok játék illetve tárgy van amivel a gyerekek figyelmét sokáig leköthetjük. Csak ajánlani tudom!" "Teljesen azt kaptuk,amit szerettünk volna! Gyönyörű a környezet,az udvar,a szobák. Teljesen megfelelő volt a tisztaság. A szobák gondosan felszereltek. Az udvar fantasztikusan rendben van tartva,és folyamatosan fejlesztik. A házigazdák barátságosak,kedvesek és segítőkészek. Hibátlan az egész! Ezentúl minden évben ide látogatunk vissza. Nagyon elégedettek voltunk." Based on the reviews and comments of actual guests, the services of the Melinda Vendégház Parajd have received a high rating of 9.9/10.